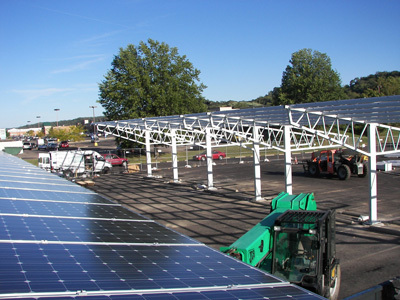 On November 18, 2010, there was a solar celebration in Athens, Ohio to recognize the City of Athens, Ohio for the installation of a 224 kW solar electricity system. At the time of the celebration, this was the single largest municipal photovoltaic (PV) installation inside the State of Ohio. 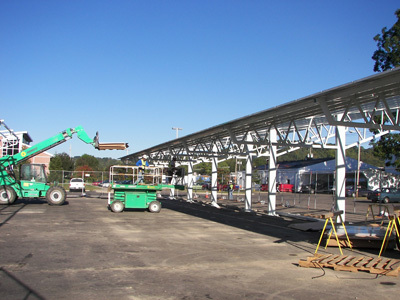 As you can see from the pix, the installation was done in the form of a carport so the solar panels take up no ground space and no roof space while creating protection for the cars in the parking lot. All materials were made in the US and all of the labor was done by Ohio citizens. The cost of the project is $1.9 million. 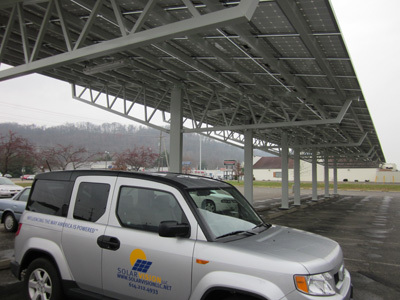 The city has entered into a 20 year power purchase agreement with SolarVision, an Ohio company, buying the power generated by the carport solar array, at a reduced cost, with SolarVision owning, operating and maintaining the array. There is an online meter that logs the data for the solar electricity being generated by the system. The installation is located at the Athens Community Center just a few miles from Ohio University. Electricity is being generated without pollution. Nothing burns or turns. The system sits perfectly still and will probably generate electricity for the next 20 to 30 years without pollution and without taking up any space. 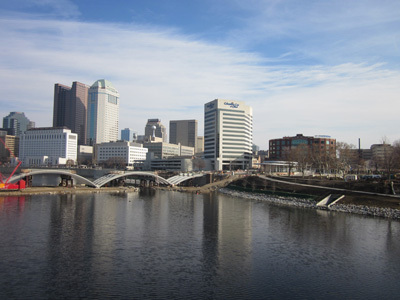 Cities like Athens, Ohio do not have a lot of cash on hand so financing devices like the power purchase agreement allow municipalities to purchase large solar electricity systems without the need for any capital dollars and without any obligation to maintain or repair the PV system over the next 20 years. 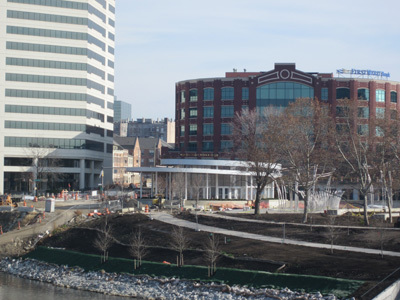 This is a great model for other cities and there are many other similar such projects planned throughout Ohio in 2011 and beyond. But Athens was the largest and one of the first such installations. Parts of the country like Southeastern Ohio have an image as being too cloudy for solar electricity. 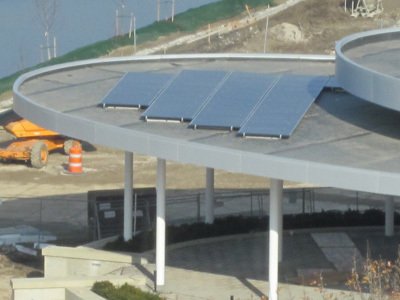 Rather than argue about the validity of such a statement, the City of Athens put in a system that is almost one quarter of a MW and allows the data to be viewed on line 24 hours a day to prove that Athens, Ohio and Southeastern Ohio are actually great locations for these kinds of solar electricity systems. At the solar ribbon cutting/solar celebration, there was a large crowd of on lookers. 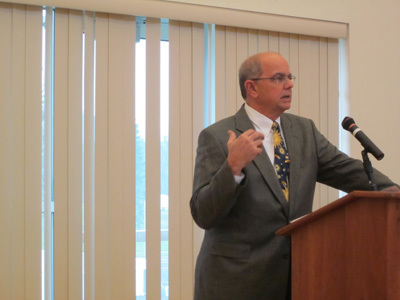 Athens Mayor Paul Wiehl spoke as did City Council Member Elahu Gosney and State Senator Jimmy Stewart. 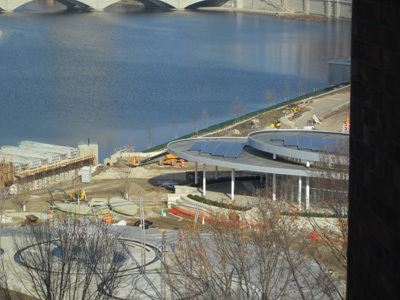 Dovetail Solar and Wind, an Athens, Ohio company, ran through a series of slides showing the entire installation. American Electric Power (AEP) the local electricity provider was thanked for their participation in the project and AEP was represented by Anthony DeBord, also an Athens, Ohio resident. This project will appear in the AEP Learning from Light Initiative for its educational value to the residents of Southeastern Ohio as well as to students throughout the country who will be able to study the installation using the data link listed above. SolarVision was represented by my friend Greg Kuss. He talked about how lucky they were to find great local partners and to get state and federal assistance. But I have known Greg a long time and I know this was his vision and that this installation meant more to him than anyone else in the room. He is one of the founders of SolarVision and he worries about the bottom line as any business person does, but you could tell this project was a labor of love. He kept smiling because he was so happy that the dream he had was finally being realized. He has many many larger solar projects in the works, but I could tell that this one was special. He had teamed with Governor Strickland and Mark Shanahan (who also spoke) and the federal government through stimulus money and the City of Athens and so many others, but when Greg was standing up there at the podium and when he turned the symbolic switch to launch the solar electricity flow into the building it was more like he was adding this solar carport into his list of accomplishments. It may not be as important as his family, but I could tell on that particular day it came pretty close. 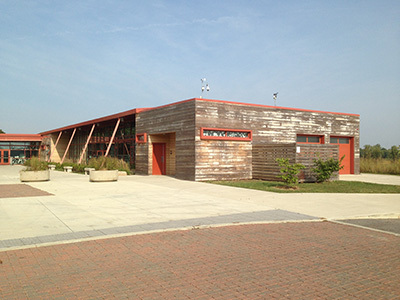 In Columbus, Ohio, New Albany High School students and teachers have created an “off grid” solar powered nature preserve trail lighting system using Solar Panels donated by American Electric Power (AEP). Twelfth grade student Student Samantha Lustigâ€™s Senior Community Service Project included teaching approximately 250 students, in twelve physics classes, about solar energy concepts and applications. The students helped with site preparation, installation, and connection of the solar powered trail lights. In addition to assembling and wiring the lights, sophomore students dug a trench for the underground wiring. The 30 trail light posts are spaced over 360 feet, beginning at the student-assembled 1 kilowatt Solar Panel, and running through the schoolâ€™s wetland preserve, ending at the Band and sports practice field. The light posts line the trail and allow students and local residents to walk safely to and from sporting events and through the nature preserve at times when daylight is dim in the early mornings and at dusk when wildlife may be more visible. The concepts of â€œEnergy Transferâ€ and â€œConservation of Energyâ€ through our Solar Energy Project are now a permanent of the school districtâ€™s physical science K-12 curriculum. Athens, Ohio was the site of a perfect storm – a perfect solar storm. Dr. Paul Grippa, principal of Athens Middle School, received a call a few years ago to see if he was interested in getting a solar system installed on his school. â€œAbsolutely!â€œ “American Electric Power donated the solar panels as part of AEP’s Learning from Light Initiative and the project took off,” according to Glen Kizer, President of the Foundation for Environmental Education. C. Describe renewable and nonrenewable sources of energy (e.g., solar, wind, fossil fuels, biomass, hydroelectricity, geothermal and nuclear energy) and the management of these sources. Students, staff, and the public can log on to see how much power is being generated. 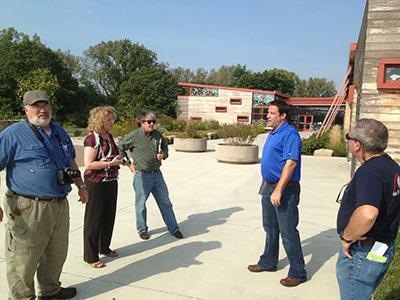 Variables such as temperature, length of day, clouds and air quality can be explored. Greenhouse emissions avoided and historical data can also be viewed. Dedicated September 25, 2006, Mayor Ric Abel, Commisioners Mark Sullivan and Bill Theisen, Councilwoman Debbie Phillips, school staff, students and parents were there to celebrate. *Historical pictures courtesy of the City of Athens photo gallery.